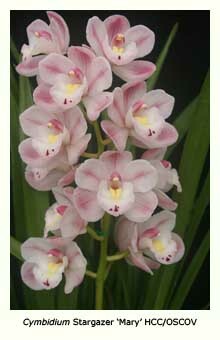 Cymbidiums do not have a rest period and must be grown vigorously all year round. They grow most actively during the warmer months, especially in autumn, and merely slow down during the cooler months. A vigorously grown plant produces large bulbs and these in turn produce large flowers and many of them. For successful culture three factors reign supreme. They are Sunlight, Water and Feed. While other factors must be considered, these three are the most important. Sunlight. 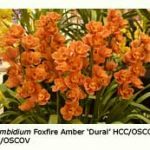 Cymbidiums require a maximum of sunlight (just below the level that will burn their leaves) for optimum growth and flowering. For a mature plant this means full morning sun during summer, with up to 50% shade in the afternoon and up to full sun all day during winter. If the plants are grown outdoors, place them under the north-facing eaves of your house during winter and the east-facing eaves during summer. If they are grown under trees, position them to the north of the tree in the winter and the northeast during summer. Don’t put them in deep shade under heavy-foliage trees or in a fernery, as they will probably not receive enough light to flower. Make sure that they are protected from frosts in winter. If you have a glasshouse or shade house, a clear glass roof or plastic cover provides sufficient protection during winter, but shade cloth should also be applied between late September and mid-April. Watering is best done early in the morning. In summer this ensures that the plants are well hydrated and ready for the hot day ahead. During very hot weather a further watering at night may be beneficial. Avoid watering over the foliage during the heat of the day. Damping the surroundings on very hot days will both cool the atmosphere and add humidity. In winter try to water on a sunny day so that the leaves and flowers do not stay wet for long – this minimises the possibility of infection. Feed. 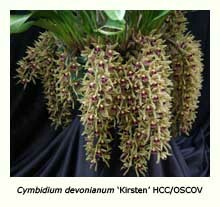 Cymbidiums are gross feeders and grow best with a constant supply of balanced fertiliser. For optimal flowering they require a lower nitrogen concentration than that provided by many general-purpose fertilisers. 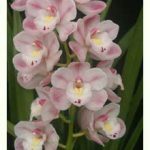 We use and recommend Atlantis Orchids Super Brew®, which should be applied weekly, or even twice weekly when growth is most active. Potting. 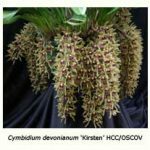 Cymbidiums should be re-potted regularly into a plastic pot or other container that will accommodate their roots for two or three years without disturbance. Re-potting is best done in spring, after they have flowered and before the heat of summer. Alternatively, re­potting may be carried out in March, before the cold of winter. When re-potting, remove all old and dead parts of the plant and aim at leaving a minimum of 2-3 bulbs with healthy leaves and (preferably) a new growth. Sterilise any cutting tools used before and after their use on each plant with a saturated solution of the paint cleaner, Tricleanium®. It is important to cause as little damage as possible to the roots. Choose a suitably sized container and position the plant so that its older part is near the edge and that its growing part has enough space to grow for the next two or three years. Add compost up to the lower third of the bulbs, make sure that it has settled around the roots and then firm it down. By covering the lower third of the bulbs you ensure that the roots stay moist between watering, even though the upper layers of compost may have become dry. It’s best to leave the top of the compost about 10 mm below the rim of the pot, so that no compost is lost during watering. Water the plant thoroughly after you have re-potted it. When re-potting a small plant into a larger container, it may be sufficient to merely reposition it and to add more compost without disturbing the root mass. This operation is called potting-on. Black plastic pots are best, because they are light, relatively cheap and impermeable. Good drainage is vital for healthy roots and if this is inadequate do not hesitate to cut wider holes around the base of the pot. Flowers. 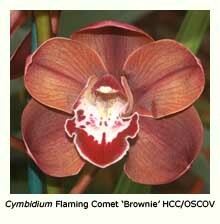 Cymbidiums may flower as seldom as once every few years to as often as twice or even three times per year. 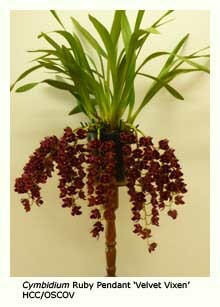 Some bulbs produce a single flower spike, others two or occasionally even more. Four or even six spikes per bulb are possible among the smaller-flowered varieties. Smaller plants usually have lower flower counts. 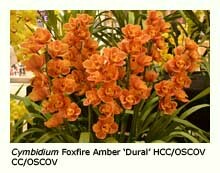 Cymbidium flowers will not tolerate the extremes of light and temperature that their plants will. They require more shade and a narrower temperature range (ideally 5-25°C), and it is essential to avoid exposure to frost. 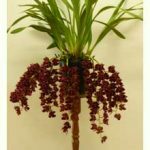 Flower spikes should be supported as they grow but allowed to develop naturally – that is, to arch, become pendulous or remain upright. The flowers may all open together or open over a period. They may be left on the plant for their life. The plant may be taken indoors for enjoyment but this will severely affect the normal growth of the plant and it may not flower the following year. If cut flowers are required, it’s best to cut the spike about a week after its last flowers open. Put it in a vase of water in a cool, airy room and the flowers may last for up to three months. However this period will be less if the room is heated or air-conditioned. For maximum flower life, cut about 10 mm from the bottom of the stem each week and change the water in the vase. Water additives are of dubious benefit. Some flowers, particularly early flowering varieties and miniatures are unsuitable for picking, as their flowers don’t last well when cut. Bring these plants indoors for enjoyment but move them outdoors regularly for water and refreshment.